We are a leading Manufacturer of brass hose nozzle, brass garden hose fittings, brass hose barb, brass hose adapter, brass male adapter and brass hose fittings from Jamnagar, India. 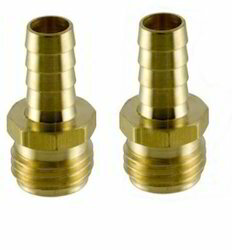 Brass Heavy Duty Twist Hose Nozzle features reliable, smooth operation every time. Wash the car, water the plants or simply clean your side - it’s the one nozzle that does it all. Spray adjusts from gentle shower to high-pressure stream in one smooth motion. Ensures maximum water pressure where you want it. Solid brass one-piece inner core resists damage, rust, leakage, and stands up to years of continuous use for reliable operation and a lifetime of dependable performance. The nozzles are made of brass. 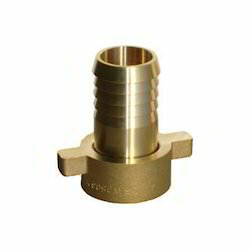 Brass is a common metal which is widely used in the manufacture of water valve and nozzles. The most important is, brass can be used with water or oil for a long time, which with good ability to resist pressure and rust. They are durable and practical. Customers can avail from our wide array of Brass Garden Hose Fittings that is made in accordance with the industry defined quality norms. The offered product is widely preferred in the Water Pump, Textiles, and Electronics fields because of its attractive features. Apart from this, the offered product is available with us at industry leading prices within committed period of time. Our Company is highly instrumental in offering the best quality Brass Hose Barb to our valuable customers. This product is used in Auto Industry, Industrial Assembly, Electrical, and Electronics. Manufactured using ultra-modern machines, we offered these barbs in different size and specifications. Apart from this, we are offering these products at very reasonable rates. 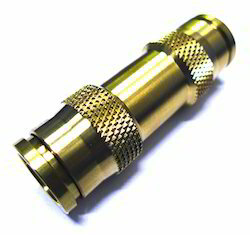 Keeping the diverse demands and needs of customers in mind, our organization is involved in offering a supreme quality array of Brass Hose Adapter to our clients. This product is manufactured by experienced professionals using advanced tools and quality proven material. Owing to their high corrosion resistance and optimum finish, these products are widely demanded in the market. Apart from this, we are offering these products at very reasonable rates. 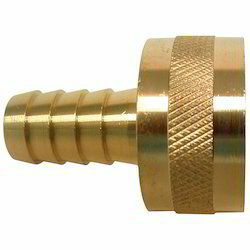 We are offering a qualitative range of Brass Male Adapter which is manufactured by highly skilled professionals using high-quality components from the reliable vendors of the market. Owing to their sturdy construction and excellent performance, these products are widely required by the customers. These products are admired owing to their performance, easy installation and longer working life. We are a renowned and customer centric firm, which is engaged in delivering a comprehensive range of Brass Hose Fittings. The offered range of fitting is available in different specifications such as sizes and can also be made in accordance with the requirements of our esteemed patrons. Apart from this, we are offering these products at very reasonable rates. 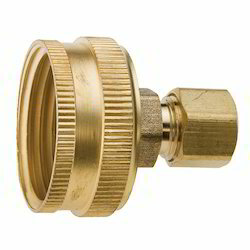 We are the leading name in the market engaged in offering a wide assortment of Brass Garden Hose Fittings. Entire ranges are made under the strict assistance of best quality controllers. We are offering these products at the nominal market price. These products are highly acclaimed due to optimum grade raw material and perfect dimensions. 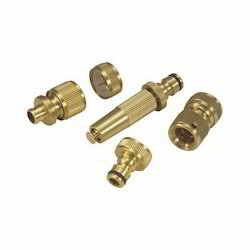 We are involved in offering a wide range of Brass Male Hose Barbs to our respected clients. Our offered products are made from best quality brass and other components which bought from our reliable and certified vendors of the market in compliance with set industry standards. Our offered range of products can be availed from us at industry leading prices.